Li Yuan (566-635) - Also known as Emperor Gaozu, he was the founder and first emperor of the Tang Dynasty, ruling from 618 to 626. The Goguryeo-Sui War had severely weakened the Sui Dynasty, opening the door for its downfall. In order for that to happen though, a strong leader needed to arise and oppose it. That leader came from the Shanxi Province and his name was Li Yuan. He was governor of that region and his capital was in Taiyuan. After the Goguryeo-Sui War, the central government of the Sui had lost most of its control over outlying areas, allowing for local strongmen to rule largely as they wished. Li Yuan, who participated in the war as a logistical officer, took control of his state and began to transform it into a rival power to the ruling Sui. He built an army and it gained experience against the Göktürks on his northern border (the Göktürks were one of several tribes of the ethnic Turkic peoples who lived in north central Asia. The Byzantine Empire had employed the Turks in the Byzantine-Sassanid War). In 617, Li Yuan had brought the Göktürks under control, making him quite popular at home, and the Sui government was crumbling. His son, Li Shimin (second emperor of the Tang) encouraged him to rebel, which he did. 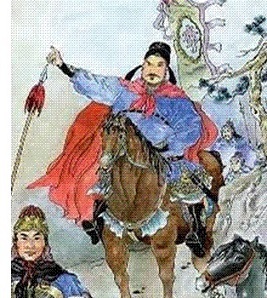 He marched into the capital of Chang'an of deposed Emperor Yang with little resistance. Not wanting to risk of civil war, he did not claim the throne himself, but installed Yang's grandson as a puppet emperor. However, when Yang was killed by one of his generals the following year, it convinced Li Yuan that he could take the throne with little or no consequence. So he removed the young Emperor Gong, the declared himself Emperor Gaozu of the newly founded Tang Dynasty. His reign was relatively short (eight years) and most of it was spent uniting China under his rule. All of China was finally brought under Tang control in 528, two years after he retired (he did not rule until his death). Li Yuan's efforts paved the way for his son who was one of the most successful rulers of the Tang Dynasty (Li Shimin was Li Yuan's second son and acquired the throne by assassinating both is older and younger brothers in an event known as the Xuanwu Gate Incident). As for Emperor Gaozu, despite overthrowing Yang, he was an admirer of his father, Emperor Wen and modeled his monarchy after him.